Welcome to our guide on alternative materials for container gardening. Tired of old, plastic or terra cotta gardening containers? Want to move your plants around, but don’t want to dig them up out of the ground? Opting for a container garden (or a few) can boost your curb appeal and freshen up your garden. Container gardens aren’t just for small apartments anymore. Regardless of your living situation, a container garden can be your way to flowers, herbs, veggies, or even small trees and bushes. The fact that so many container gardens use terra cotta pots speaks well of the durability and popularity of the material, but there are a variety of ways to upgrade that simple terra cotta planter into something that better fits your personality and gardening style, and complements the architecture of your home and the landscaping of your yard. Material: what the container is made of determines how easy it is for you to move, how well it holds moisture, and how well it encourages plant growth. Materials like plastic fade more quickly in sunlight. Size: the container you choose should reflect the size of the full-grown plant, not the size it is now. Drainage: now this is important. Plants with excess moisture will develop swampy roots and stop growing. Some materials, like tin and plastic, are easy to add drainage holes to with an ordinary drill bit, or even with a hammer and nail. Other, more fragile materials like ceramic, can require a specialized drill bit to add holes. 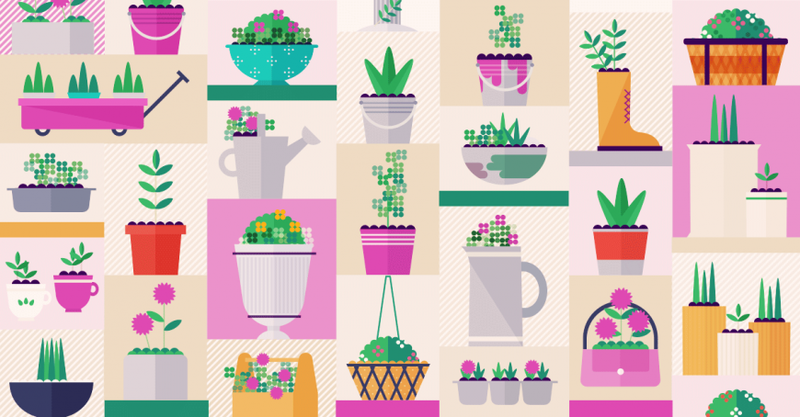 So while you sort through yard sales and big box stores, the flea market and your garage, watch out for these plant-friendly containers. Below is an illustration-based guide on creative alternatives to the basic terra cotta pot, based on Kelly Roberson’s article (used with permission). 1. Terra Cotta: there’s a lot more out there than just plain old terra cotta. Use a glaze, brightly colored gloss paint, or another decorative treatment to make it stand out. 3. Resin: resin, and for that matter, plastic, materials mimic more expensive planters like concrete without the weight or price tag. 4. Wire Baskets: old baskets are great because they have built in drainage. However, they don’t have lining. Cocoa mats cut down to size (buying by the yard is the best option) work perfectly. 5. Metal Buckets: old metal buckets are cheap and plentiful at flea markets. Give it a good scrub, drill a couple of drainage holes and you’re all set to start planting. If you’re feeling creative, train a vine around the handle. 6. Wheelbarrow: fill it with soil and plants and you have a great accent to a cottage or country-style home. 7. Wagon: whether plastic or metal, an old wagon is easy to move around (if the wheels still work). Wagons work great as water gardens (and you don’t have to drill holes that way either). 8. Plastic: these are great for kids’ container garden–just take some old plastic beach buckets and toys, drill a few holes and you’re all set. 9. Homemade Hypertufa: a lightweight combination of Portland cement, peat moss and perlite that can be easily cast in any mold. Just google “homemade hypertufa” to find easy DIY videos. 10. Bricks: bricks can be mortared together to form a water-tight container or dry stacked around a more boring (plastic) container to add a decorative touch. 11. Wooden Boxes: add some lining to a biodegradable box will help preserve them and also keeps potting soil contained. 12. Painted Containers: paint is the easiest way to transform any existing containers into whatever you desire. 13. Wine Crates: these won’t need holes drilled into them as long as the wood has some spacing in between. Add some cocoa mat to keep dirt from escaping. 14. Toolboxes: it doesn’t matter if these are metal or wooden. However, if it’s metal, you’ll have to drill a few holes. The handle makes it easy to transport. 15. Purses: once you’re done using a purse, you can fill it with shallow-rooted plants, like succulents. 16. Colanders: plastic or metal colanders have built in drainage holes and can easily be used as an outside centerpiece. 17. Ceramic or Tin Pitchers: drill a few holes and add flowers to dress up a table. 18. Apple Boxes: like wine crates, you may not have to add drainage holes if the construction is wide enough. Make sure to add holes to the liner, especially if it’s plastic. 19. Wooden Bottle Carrier: the separate sections of a bottle carrier allow you to plant and keep separate different displays or herbs. 20. Vintage Wash Basin: wash basins are often already elevated, which gives them a height advantage for decorating. 21. Mosaic Planters: the broken glass containers really dress up a garden. 22. Old Toys: old toys, like dump trucks, make perfect containers for smaller plants. 23. Baskets: you’ll need to line biodegradable baskets with plastic to keep them from rotting. 24. Birdbaths: plants with shallow roots or vines do well in wide birdbaths. 25. Water Trough: these are deep enough for ornamental grasses and can be paired with other smaller planters to create a display with a focal point. 26. Old Sinks: ceramic pedestal sinks or sink basins work great in cottage or casual gardens. 27. Half Wine Barrels: wine barrels are a classic choice. The vineyard style is not only appealing, but the barrels are also great for different kinds of plants and can work as water gardens as well. 28. Non-Functioning Fountains: the material of the fountain may prevent you from drilling holes in it, but fountains are great ways to display vines, much like birdbaths. 29. Drainage Tiles: fix the tiles together with metal brackets to create a pretty container. 30. Plastic Buckets: buckets of any size (just be sure you can lift it) make great containers and aren’t very expensive. Dress them up with paint and fill with colorful flowers. 31. Ladders: these aren’t technically containers, but they can be used as a nice display for smaller pots. 32. Old Drawers: mix and match old cast offs found at flea markets and place on a retaining wall for a unique look. 33. Metal Urns: elevating these already taller containers adds a dramatic effect to arrangements. 34. Metal Bike and Basket: like wire baskets, a bike basket can be lined with cocoa mats and the bike propped up against a shed. 35. Rubber Boots: boots come in various patterns that may appeal to your sense of style. 36. Rubber Tires: gray rubber tires are boring on their own, but a fresh coat of colorful paint and some flowers clean them up nicely. Cluster a few together or on top of eachother, and you can create a cascading effect. 37. Crockery: crocks can be pricey, but should you find one with imperfections, they make great containers for dwarf trees or ornamental grasses. 38. Fabric-covered Pots: any old pot (terra cotta or otherwise) can be dressed up with strips of fabric. Use a craft glue and keep the fabric about 1 inch from the bottom of the pot. 39. Old Canisters: They used to hold flour and sugar, and now they can hold herbs! 40. Paint Cans: cans with dried paint in them are a hassle, so purchase empty new ones for a clean look. 41. Muffin Tins: miniature succulents fit perfectly in an old muffin tin. 42. Tea Cups and Pots: these are a little fragile, so you’ll need a jeweler’s bit to drill drainage holes. A collection of varied patterns is a perfect centerpiece. 43. Mid-size to Large Plastic Food Containers: cleaned and thoroughly washed, these can make great planters for small plants. 44. Concrete Blocks: turn them over and plant in the two holes. 45. Coffee Tins: colorful vintage finds are the best, full of personality and style. Take the labels off newer ones for a table top option. 46. Old Metal Watering Cans: look for ones with wide openings. You can train vines up the spouts. 47. Enamelware Pots: these usually need drainage holes drilled, but the bright colors are worth the trouble. 48. Pluming Pipes: very wide pipes work the best for an interesting take on container gardening. 49. Strawberry Jars: these are usually used to grow red berries, but work just as well for herbs. 50. Bread Pans: metal ones work the best, and these are normally narrow enough to work as windowsill planters. They’re also easy to bring inside when necessary.